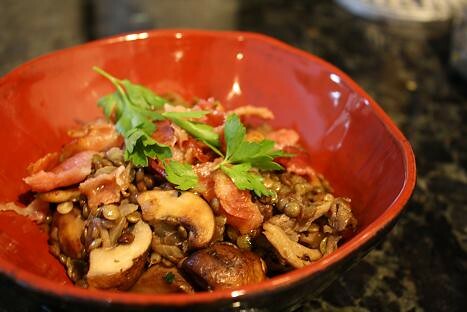 To cook this hearty dish, you only need a few ingredients: Lentils (I went for French Green Lentils), Chicken Broth, Extra-Virgin Olive Oil, Fresh Lemon, Oyster and Cremini Mushrooms, Fresh Parsley, 2 Tablespoons of Butter, 1 Clove of Garlic, a Medium Onion, and Bacon. 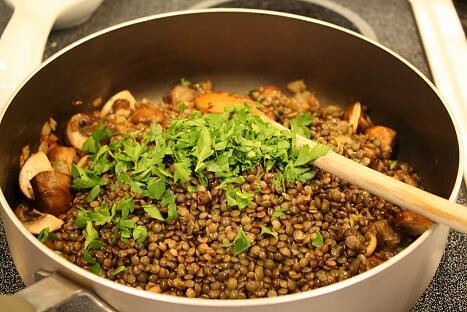 Begin by picking through the lentils for any pieces that don’t look good. 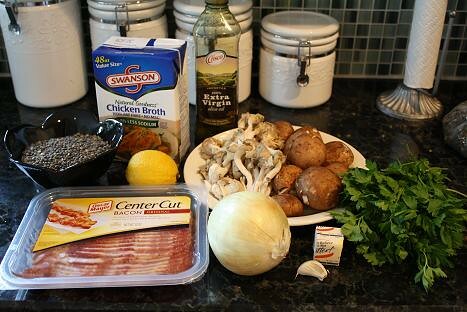 I found these pieces to be very light-weight and not looking like a lentil, so you should be able to easily pick out what doesn’t belong in your dish. 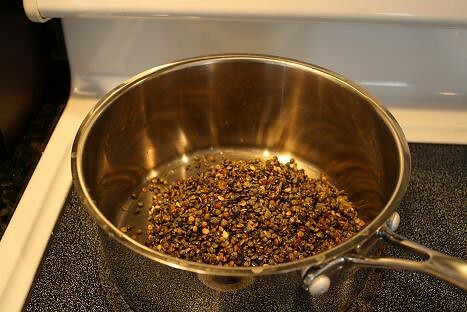 Then rinse the lentils, drain them, and put them in a large saucepan. …and bring the broth and lentils to a boil. 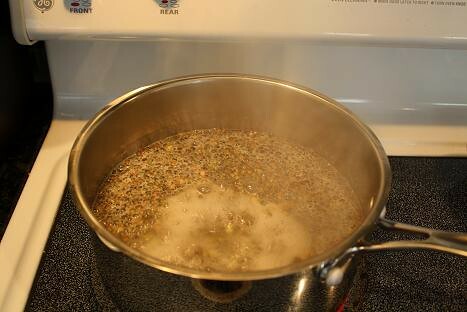 Once it boils, reduce the heat to simmer the lentils for about 35 minutes. This timeframe worked perfectly for me but you may want to keep an eye on it and just make sure you don’t overcook your lentils. If you do, the finished dish will be mushy, which is not what you are looking for. 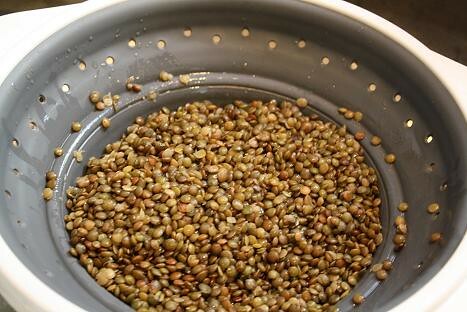 You are looking for lentils that are tender but still hold their shape so that they do not fall apart. While the lentils cook, I used this time to do my prep work. 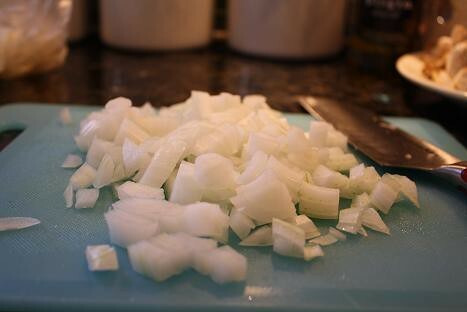 I began by finely chopping a medium white onion. 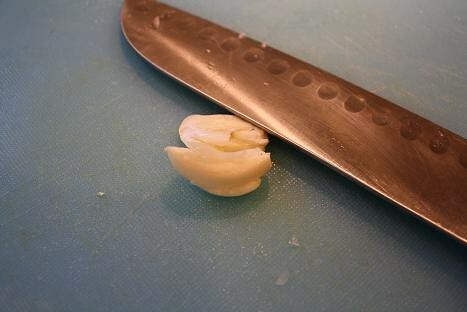 Then I took one clove of garlic and placed it under my large chef’s knife. I hit the knife firmly with the palm of my hand to both loosen the peel and smash the garlic a bit. Then I took off the peel and was left with the crushed garlic, which I set aside. Then it was time to work with the mushrooms. 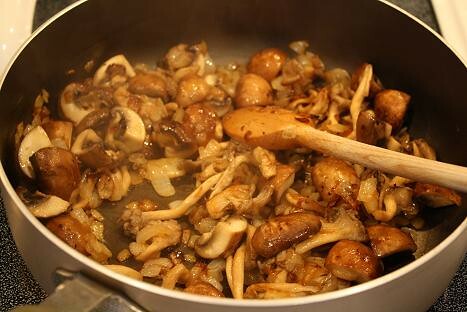 I began with the cremini mushrooms. I took a damp paper towel and wiped each mushroom to remove the dirt. 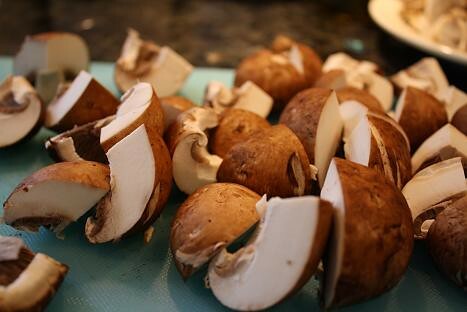 Then I cut each mushroom into quarters since these were fairly big cremini. 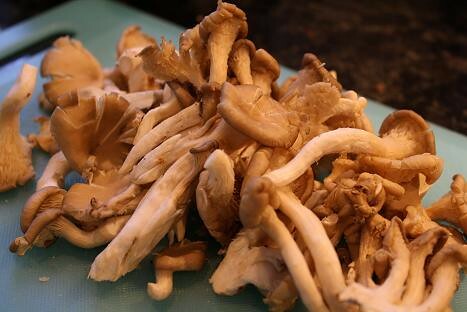 If you have smaller cremini mushrooms you can leave them whole or half them. Next up comes the cool-looking oyster mushrooms. I got another damp paper towel and cleaned each mushroom. Then I treated them almost like broccoli in the way I cut them. I cut the large clusters of mushrooms apart, so that they were more bite-size. 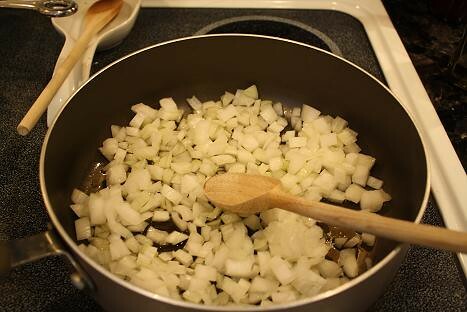 While the lentils were still cooking, I started my onions, since they would take about 10 minutes to do. 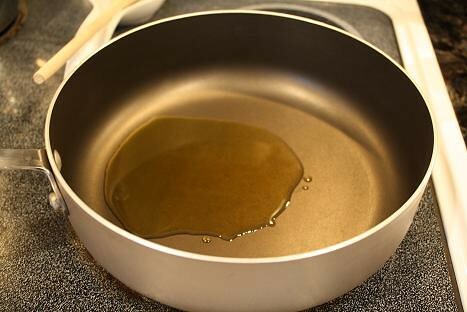 I began by adding about two tablespoons of olive oil in a pan over medium heat. 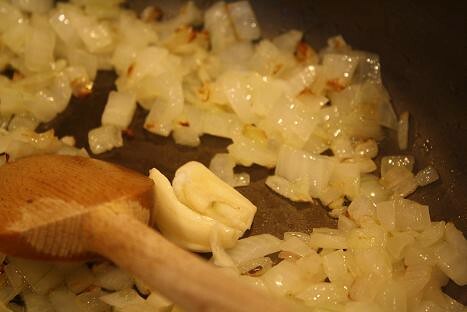 Then I added the onions and stirred them regularly for 10 minutes. 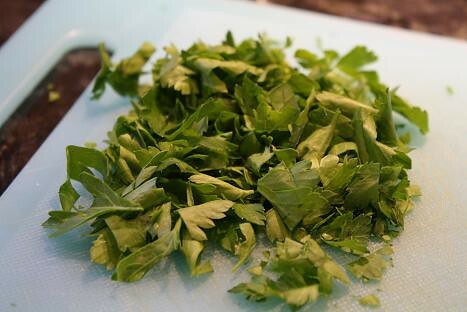 While the lentils and onions continued cooking, I chopped up about three tablespoons of fresh parsley. Then I cut a lemon in half and juiced one half. I only needed a few teaspoons for this recipe, so I put the remaining lemon in the fridge for later use. 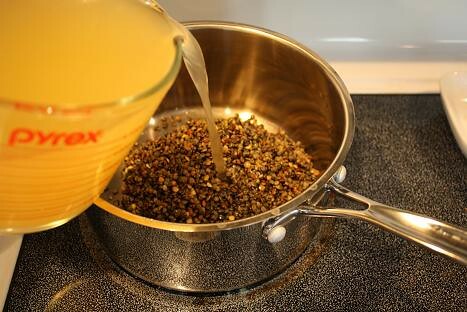 At this point, the lentils were finished, so I poured them into a colander and let them drain until I was ready for them. After the onions had cooked 10 minutes, I added the crushed piece of garlic to the pan and stirred it around for another 2 minutes. To the pan I then added two tablespoons of butter, another tablespoon of olive oil, and the cremini and oyster mushrooms. 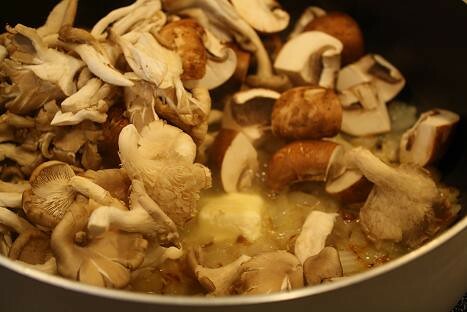 I continued to cook this mixture until the mushrooms were tender. 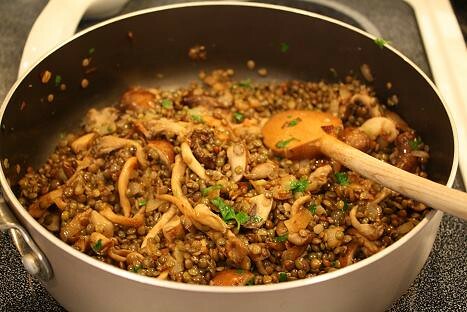 Once the mushrooms are cooked, I added the drained lentils, one teaspoon of lemon juice and the three tablespoons of parsley that I chopped. I stirred the dish around and made sure it was heated through. Now it was time to serve! While I had been cooking the onions, I started to cook some bacon on the stovetop. If you choose to add bacon, just cook it using whatever method you prefer and to your desired crispiness. 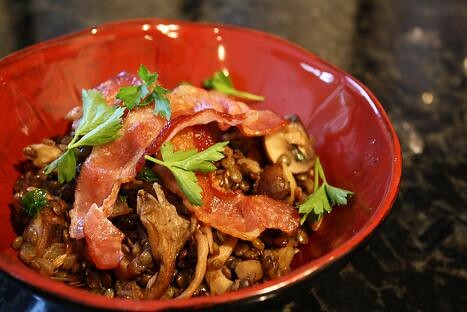 Then I spooned up the lentil mixture in a bowl, topped it with either a couple of bacon slices or bacon that had been torn apart (your choice) and some more fresh parsley. There you have it…it’s that easy! Enjoy! Thank you for this recipe. I just had it for lunch and it was delicious.